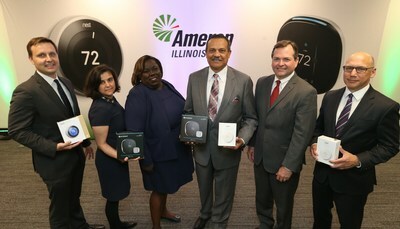 EAST ST. LOUIS, Ill., May 16, 2018 /PRNewswire/ -- Building on its commitment to help customers become more energy efficient, Ameren Illinois announced an initiative to put 300,000 smart thermostats in customer homes and businesses. Ameren Illinois Chairman and President Richard J. Mark was joined by Illinois Commerce Commission (ICC) Chairman Brien Sheahan, as well as representatives from the Environmental Law & Policy Center (ELPC) and leading manufacturers ecobee and Nest in announcing the plan Wednesday afternoon in East St. Louis. "When the Future Energy Jobs Act was passed, we made a bold commitment to ensure that benefits of energy efficiency would be available to all of our customers, especially those with limited financial means," said Mark. "With today's announcement, we're living up to that promise. Putting 300,000 smart thermostats in customer homes and businesses is an ambitious goal, but we're confident that with the collaboration of our partners we can make that vision a reality." "Smart thermostats will empower Ameren Illinois residential and business customers to better manage their energy usage, and give them more control over their monthly bill," said ICC Chairman Brien J. Sheahan. "On behalf of Governor Bruce Rauner and the ICC, we applaud Ameren Illinois for continuing the state's more than 100-year tradition of leadership on energy issues by embracing new innovation and technology, like smart thermostats, that help our state reach its energy efficiency goals." "Smart thermostats will help consumers to stop cooling and heating empty homes," said Rob Kelter, Senior Attorney for the Environmental Law & Policy Center. "With this initiative, Ameren Illinois is stepping up to help its customers save money and reduce pollution at the same time." ecobee introduced the world's first smart wi-fi thermostat to help homeowners save money, conserve energy and live more comfortably. "We applaud the commitment that Ameren Illinois is making here today and are thrilled to offer the Ameren Illinois customers a better way to save on their energy bill and reduce their carbon footprint," said Stuart Lombard, president and CEO of ecobee. Ameren Illinois' energy efficiency program is recognized as one of the best in the country – rated #12 by ACEEE, an independent energy efficiency organization. Over the past nine years, Ameren Illinois has helped its customers reduce their energy usage by nearly 12 million megawatt-hours, saving them approximately $781 million. This improved energy efficiency has enabled Ameren Illinois customers to cut greenhouse gas emissions by 8.3 million metric tons – the equivalent of taking nearly 1.8 million cars off the road for a year. Ameren Illinois delivers energy to 1.2 million electric and 816,000 natural gas customers in central and southern Illinois. The company is devoting $114 million per year to help customers reduce energy and save money on their energy bills, and expanding access to energy efficiency programs and services for moderate-to-low income customers. For more information, visit AmerenIllinois.com, find us on Twitter @AmerenIllinois or Facebook.